ANIL, 45, from India works in the oil and gas industry. Managing projects on a piecemeal basis, his work entails quite a bit of travelling. Anil flies into Malaysia several times a year, sometimes it is a week, sometimes two. Renting an apartment is not cost effective, likewise staying two weeks at a hotel. Accommodation has always been an issue, until about a decade ago with the appearance of serviced apartments, which he can rent on a weekly or monthly basis. “I just need a decent place to return to after work where I can call for room and housekeeping services but without having to bear rates equivalent to hotel charges. “Hence, a serviced apartment seems to be the best option. Occasionally, I use the gym and of course, Internet connectivity is a must. If I want to meet friends, there are food and beverage outlets nearby,” he says. Anil belongs to a group of mobile workers who have to pack up and leave at the drop of a hat. They have no time to cook, or to be bothered with the daily household chores that come with renting a condominium. An artist’s impression of Eastern & Oriental Bhd’s St Mary Residences, which will be located in the central business district of the KL City Centre. As the city and the job market evolve, Kuala Lumpur will be seeing more serviced apartments entering the market. By 2012, Kuala Lumpur will have another addition with the entry of Eastern & Oriental Bhd’s (E&O) St Mary Residences CBD in Jalan Tengah, behind Menara Weld. The project is jointly developed by E&O and the Lion Group. When it was launched in June, prices average RM1,000 per sq ft with early bird purchasers paying about RM900 per sq ft. The second launch was priced 25% higher at an average of RM1,250 per sq ft. Although the project is currently marketed as a new home, a second home or an investment, the 657 units are being fitted like a hotel room with 34,400 sq ft of retail space. It will also have a one-acre park. There may be plans to provide housekeeping services later on. Comprising three blocks, Tower C and A are currently on the market while Tower B, which will have about 200 units, will be returned to the Synod of the Diocese of West Malaysia, the previous owner of the 4.04-acre freehold tract. The development will have a swimming pool and a clubhouse as well as a meeting and function room. When Tower C was launched, E&O priced it cautiously. It was among the first project to be launched in the city after the September 2008 fall of Lehman Brothers. E&O group itself had not launched anything in 2007 and 2008. With the good response, it appears it had underpriced the project and are trying to get back on the pricing. To justify that increase, it enhanced the package by offering a more furnished unit right down to curtain railings, while those from the first phase only had a fitted kitchen with appliances. At the same time, buyers for the first phase enjoy a capital appreciation, the source says. There are several serviced residences in the Jalan Raja Chulan vicinity with unit sizes ranging from 500 sq ft to about 2,000 sq ft. In the case of St Mary Residences, the developer is offering reasonable sizes, says Regroup Associates Sdn Bhd executive director Paul Khong. It has the right target segment for investment purposes – the units are small from about 1,000 sq ft to 2,300 sq ft. On a per unit basis, it is affordable. E&O also provides the 10/90 financing package which make it convenient for buyers. Khong adds that only selected niche developments within a good location, a right theme/concept and a branded developer will be able to carry a premium price in their projects. E&O executive director Eric Chan says the company has made the project as convenient as possible for the regional market. It aims for foreigners to constitute 20% of buyers in Tower A. A major consideration is utility rates will be on a commercial basis. Generally, when a developer build on commercial land, the project comes with retail facilities as opposed to a project on residential title, which will not have the retail podium. The setback is that for a project with a commercial title, the utility rates will be 25% to 30% higher compared with one on a residential title. In the case of St Mary Residences, although the project is on commercial land, the developer has managed to keep the utility rates at residential levels. For those who bought into St Mary with the intention of renting out their units, they may have a bit of trouble due to the current economic slowdown, an industry source says. “Many would have invested in it to sell or rent. The global situation is still wobbly and it is difficult to say what 2012 will bring,” the source says. At press time, Pacific Regency located near St Mary Residences is having a 70% occupancy rate. A customer service officer says since Pacific Regency offers short and long-term stay, it has a pretty good following compared with those that offers only a minimum of a year’s lease. About 60% of Pacific Regency’s guests stay on a daily basis while the rest take a longer lease. Most of its guests are from the oil and gas sector. “In terms of cost, we are more economical than a hotel, and there are only five-star hotels in the vicinity. We also offer housekeeping and 24-hour room service. “This is what most of our guests need. We also have three dining outlets for those who want to meet visitors in a restaurant setting,” she says. There are other choices for people like Anil who want the option of short and long-term stay other than Pacific Regency. There is UBN Tower next to Shangri-La Hotel which offers a minimum of a year’s lease, and closer to the Mandarin Oriental, there is also the Ascott in Jalan Pinang. Operated by Singapore-based The Ascott Group, its portfolio in Kuala Lumpur also includes Somerset Ampang, Somerset Seri Bukit Ceylon, Marc Service Suites and Seri Bukit Ceylon Residence. According to its website, The Ascott is the world’s largest international serviced residence owner-operator with around 19,000 units in key cities of Asia-Pacific, Europe and the Gulf region, as well as about 6,000 units which are under development. It has three brands internationally – Ascott, Somerset and Citadines. The Ascott Group is a wholly-owned subsidiary of CapitaLand Ltd, one of Asia’s largest real estate companies. One Residency, located behind Hotel Istana, is the latest addition this year but it will be St Mary Residences that will be interesting when it is completed, as it is expected to set a new benchmark in the Jalan Raja Chulan vicinity. E&O, after all, prides itself as a lifestyle developer and it will make sure that the project spells l-i-f-e-s-t-y-l-e.
Last year, YTL Land made a net profit of RM3.3 million on revenue of RM279 million. Even though the CP Group has made big strides as a property developer and asset owner, it is not keen to join the other big property players to seek a listing on the local bourse or build up its landbank. From left to right: CP Group executive chairman Datuk Tan Chew Piau; his son Marvin Chen; and executive director Datin Jane Yeo. Instead the philosophy of its executive chairman Datuk Tan Chew Piau is “not to overfill our plate” but to undertake projects at its own pace. Besides keeping busy at its Queensbay development in Penang, it will also expand its presence in the hospitality sector and further build up its Eastin brandname. Tan says maintaining its private entity status has granted CP the freedom to do away with red tape associated with listed companies when it comes to venturing into new investment opportunities. “When opportunity arises, we can move with greater ease,” Tan says in an interview with StarBizWeek. Tan should know as he was the managing director of second board company, Chew Piau Bhd, from 1991 to 1993. He sold his stake in 1993 to set up CP Group. “We are not keen to tie up our funds in huge landbank and will prefer to acquire land according to needs and build at our own pace,” Tan adds. He says keeping lean has cushioned CP from the difficult times including three major recessions and the latest global financial crisis. “I am happy with the growth of the group which has exceeded my expectation,” Tan enthuses. CP has come a long way as a small class contractor in the 1970s. Today, it has ventured into property development, hospitality and retail asset investment, and is on the look out for other viable opportunities both within and outside the country. Overall, the group expects a 10% to 15% annual income growth. “We are targeting a 8% to 10% annual growth for our retail and hospitality income, and also a healthy growth for our property development division. We see an improvement in market sentiment and plan to launch new projects next year,” Tan says. Tan sees the two property divisions as complementary to each other. While the retail and hospitality assets provide regular income streams to the group, property development provides better return on investment and higher income growth as the turnaround time is faster, although it is subject to higher risk and more volatile market conditions. In property investment, it owns and operates the 388-room Eastin Petaling Jaya and the soon-to-be-opened, 328-room Eastin Penang, which are both four-star business class hotels. Its maiden retail asset is the Queensbay Mall, the largest shopping mall in the northern region with gross built up of 2.5 million sq ft and net lettable space of 1 million sq ft. It has 500 retail outlets and an occupancy of 95%. In 2003, CP signed a definitive agreement to take over the Bayan Bay project, which was abandoned in 1998 during the Asian financial crisis. Revival work started in 2005 and the development was renamed Queensbay. The 70 acre development was originally undertaken by Eternal Resources Sdn Bhd, a 70:30 joint venture between the now defunct Anson Perdana Bhd and the Penang Development Corp. CP was picked as the white knight over seven other bidders to revive the abandoned project. Development of Queensbay is divided into 13 parcels comprising luxurious residences, a retail mall, shop offices, signature office suites, corporate towers, serviced residences, business class hotels, a convention centre, a medical centre, marina and waterfront retail shops. With a ratio of 35:65 between residential and commercial components, it will have an estimated gross development value of RM2bil and is targeted for completion in seven years. So far, five parcels - Queensbay Mall, Eastin Penang, BayAvenue, BayGarden and BayStar - have been completed. The completed properties include commercial shop houses, semi detached houses, bungalows and condominiums. The remaining eight parcels on about 30 acres will have waterfront residences and mixed commercial development. In hospitality, Tan has big plans for Eastin and plans to build it up into a strong hotel management brand within and outside the country. The countries targeted include Vietnam, China and Indonesia. According to Tan, the hospitality industry is a long term business and if it is managed properly, it can be lucrative and very fulfilling. With the group’s second hotel project set to open for business in Queensbay on Nov 12, he is already eyeing a third Eastin hotel, also in Queensbay. 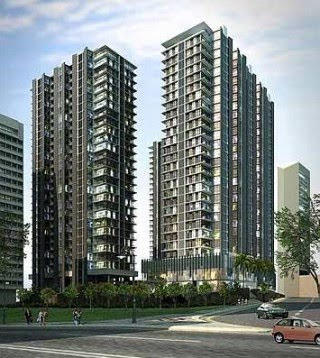 With an estimated investment of RM130mil, the 14 storey-Eastin Penang has 328 rooms. It is positioned as the preferred hotel for business executives. Tan still remembers the time when he first ventured into his maiden hotel project - Eastin Petaling Jaya. It was just before the Asian financial crisis when he invested RM100mil to build Eastin Petaling Jaya. The hotel is easily worth RM250mil today. It was one of the two hotels (the other being Mandarin Oriental) that were completed in 1998 when the Asian financial crisis hit. “Our perseverance paid off finally and Eastin Petaling Jaya has since become an iconic brand for business class hotels in the country. The hotel has clocked up average occupancy rates of 68% to 70% in the last 11 years,” Tan says. He says many interested parties have made their offers to buy over the hotel but he is not keen to sell. His wife, Datin Jane Yeo, an executive director of CP, attributes Eastin’s success to Tan’s hands-on management style and passion for the hospitality business. “We don’t believe in outsourcing the management of our hotel and retail assets to other property managers or hotel chains and prefer to groom our own team of experts to manage the properties,” she says. Tan says the Eastin team is now capable of extending its expertise for managing business class hotels both nationally and beyond Malaysia. He sees the Eastin brand spreading its foot-print regionally in the near future. To consolidate and strengthen its leading brand position, Tan says Eastin PJ will be undergoing major refurbishment next year. Moving forward, Tan says Eastin is now exploring a demand-based pricing structure to give the best deals to its guests. It has plans to issue Eastin privilege cards for frequent and loyal business clients. “Eastin PJ has been profitable since its first operating year, despite being hit by the Asian financial crisis. So generally, I am confident our new Penang hotel would do well based on our experience in managing and operating a hotel over the past decade. It can look forward to an occupancy of over 80% upon its opening as it coincides with the seasonal peak period. “The Penang government’s focus on tourism and knowledge based industries will draw more well heeled tourists to the island. And, with the construction of the second bridge underway, and the hotel’s proximity to the free industrial zone and the Penang International Airport, it will become the premier business class hotel for the northern region,” Tan adds. Property buyers and investors are facing a double whammy – the proposed reimposition of the real property gains tax (RPGT) come Jan 1 and the inevitability of having to pay higher mortgage rates. Coming at the heels of each other, they certainly spell the end of the short “honeymoon” for property buyers that kicked off early this year when developers started to introduce various housing packages and easy payment schemes to promote sales. Since the announcement of the proposed reimposition of the real property gain tax (RPGT) on Oct 23, real estate investors and owners are still hoping that the Government will review the proposed tax reinstatement. Deputy International Trade and Industry Minister Datuk Mukhriz Mahathir’s remark on Wednesday that the Government may reconsider the RPGT’s reimposition after receiving feedback from all parties gave them hope that a reprieve may be in order. Although some argue that a flat 5% tax on gains from property disposal is quite fair and not overly excessive, property buyers and investors worry that this may mark the beginning of reverting to the original tax scale. Prior to the exemption of the RPGT in April 2007, tax on gains from property sales was on a progressive basis from 30% to 0% depending on the holding period of the property. Any gains made from properties that have been held for more than five years will not attract any tax. However, the latest measure to extend the 5% RPGT to all gains from property disposal irrespective of the holding period, will mean that long held properties that may be centuries old will also be affected. This has not gone down well with property owners as they see it as an enactment of an inheritance tax although Malaysia has no such tax legislation. Their main grouses are that non property speculators have never been subjected to such a tax before and why impose one now and tax them at the same rate as those who speculate or “flip” their properties for quick profits. If the proposal under Budget 2010 for the flat 5% RPGT is just a temporary measure and changes are made down the road, they will be regarded as “flip flops” on the part of the Government on real estate matters. Certainly, the timing is also a factor as efforts to promote Malaysian properties to overseas investors are just kicking off. The Government has recently allocated RM25mil to kick start efforts by Malaysia Property Inc (MPI), a joint public and private sector initiative, to bring Malaysian projects to overseas investors. MPI has set a target to sell RM2bil worth of properties next year and the countries in its radar include Japan, South Korea, China, India, Britain and the Middle East. In fact, MPI officials were leading a team of Malaysian developers to participate in a property exhibition in London when they heard news of the proposed reimposition of the RPGT. They have to answer to the many concerns of the potential British investors on the tax measure. If such promotional efforts are properly coordinated and do not lead to over speculation in Malaysia’s property market, having more inflow of foreign investment in local real estate will be able to promote more depth and breadth in the local market. This is especially true if developers continue to improve on their project design capability to international standards. Meanwhile, rising mortgage rates since early this month and plans by banks to introduce risk-based pricing in the calculation of interest rates will raise entry cost for new home buyers. Some of the banks have also stopped absorbing the legal fees, stamp duties and other disbursement fees for loan documentation from their home loan offerings. If the interest rates continue to move up, there will be knee-jerk reaction in buying interest and take-up rate in the short term. Whether sentiment will be affected in the medium to longer term remains to be seen and it will largely depend on the strength of the country’s economic recovery. Buyers will certainly shop around for value property and hopefully some freebies before signing up. Deputy news editor Angie Ng says although sunnier days may be here again, Malaysians are not out of the woods yet and any new tax proposals that may be burdensome to the people are untimely. PETALING JAYA: Damansara Realty Bhd (D Bhd) has proposed to implement a restructuring exercise that will eventually lead to the transfer of its listing status to subsidiary Insan Kualiti Sdn Bhd (IKSB). “The proposed corporate restructuring offers an opportunity for existing D Bhd shareholders to participate in the potential new businesses to be injected into (IKSB), particularly the Tanjung Langsat Industrial Area and Tanjung Langsat port services operations,” D Bhd told Bursa Malaysia yesterday. Under the plan, D Bhd proposed to exchange all of its 250 million shares for new shares in IKSB plus cash, on the basis of 0.6 new IKSB share plus 32 sen cash for every one D Bhd share held. In the meantime, IKSB will acquire Tanjung Langsat Port Sdn Bhd (TLP) for RM249.05mil and TPM Technopark Sdn Bhd for RM54.80mil from Johor Corp (JCorp). The total purchase price of RM303.85mil will be partly settled via the issuance of 229.73 million new IKSB shares to JCorp at 80 sen each. IKSB will then sell all 250 million D Bhd shares to JCorp for RM200mil to be satisfied by RM80mil cash, while the balance RM120mil will be off-set from the acquisitions of TLP and TPM. IKSB will then assume D Bhd’s listing status. The whole exercise is targeted for completion by the third quarter of next year. DIJAYA Corp Bhd’s subsidiary, Mawar Hebat Sdn Bhd, has agreed to buy 36 parcels of land measuring 7,131 sq m from Mentari Land Sdn Bhd for RM19.5 million. It plans to carry our commercial development on the land along Jalan Klang Lama, Kuala Lumpur. The deal is in line with its aim to increase its land bank for development to generate sustainable income for the group, it told Bursa Malaysia.